[Newly published research by two archaeologists at Tel Aviv University in Israel shows that camels weren’t domesticated in the eastern Mediterranean until the 10th century B.C.—several centuries after the time they appear in the Bible. While there are conflicting theories about when the Bible was composed, the recent research suggests it was written much later than the events it describes. This supports earlier studies that have challenged the Bible’s veracity as a historic document. 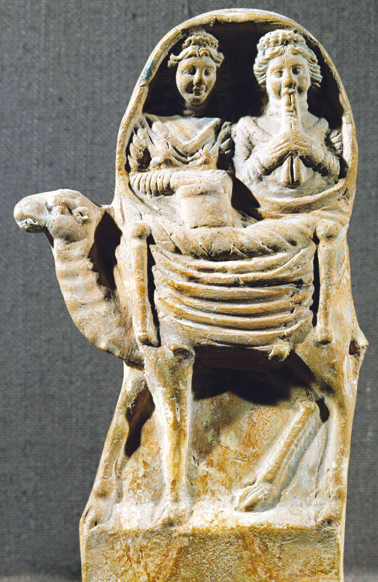 [The dromedary was probably first domesti­cated in southern Arabia around 3000 B.C. Most probably the dromedary, or one-humped camel, was first domesticated in East Africa which had the largest population and oldest population; and from there it went to Arabia while trading with Yemen. This issue provides one more evidence about the lack of historicity of the Hebrew Bible and the Old Testament. When tales fail to provide a single scientific evidence for more than 3400 years this is the strongest proof that they are fiction made out of thin air. There are a lot of logic and common sense in new hypotheses to replace the falsehood of the present narrative working against corrupt and ignorant churches, politics, and academia and surly truth will prevail. Abraham went to Egypt and he didn’t notice the Pyramids! ; large population of nomadic herders surviving in a desert like Egypt! ; wandering in Sinai 40 years! ; no records in Egypt who recorded even the number of cats! ; staying for 430 years without leaving a single grave!, or borrowing both ways between languages! ; failing to identify a single Egyptian king they lived under his rule during 4 centuries! and much more. The Old Testament must not rely on the Hebrew Bible because it is clearly unreliable and written with political intentions and goals. The Hebrew Bible is definitely not a book of faith, truth, history, or holy. The Refuge of Israelite 1876 -1476 BC is most probably was in Abyssinia (ancient Ethiopia) and not Kemt (ancient Egypt). And, the Exodus was across Bab-el-Mendab “the Gate of Grief/Sorrows” and not across Sinai. This will make the ancient Israelite pure Yemeni Arab tribe. It will also challenge the story that Abraham was born in Ur, Mesopotamia (ancient Iraq). This will also cast doubt about the claims which state that the Arabs and Israelite are Semitic, while the Canaanite were Hamitic. But the most important doubt is on the Biblical legitimacy of the modern State of Israel. Surly The Abyssinian Refuge hypothesis is much more logical and closer to the truth than the The conventional Egypt hypothesis, and The Arabia only hypothesis. For those Christians who take the Old Testament as literal truth, the above research and conclusions will be dismissed out of hand. When logic and/or archeological evidence refutes or casts doubt upon what people have believed all their lives, people will often choose to remain in a state of denial. As we noted in an earlier comment on another post, the OT was in oral tradition for centuries before finally being committed to writing. So, of course, the written version(s) are referring to events long since past. Oral tradition is problematic as the repeaters of it can not always resist the temptation to alter it and embellish certain elements and/or distort other elements of the narrative that was handed down to them.